This maki-e fountain pen was created by maki-e artisan Shinsai in Japan. 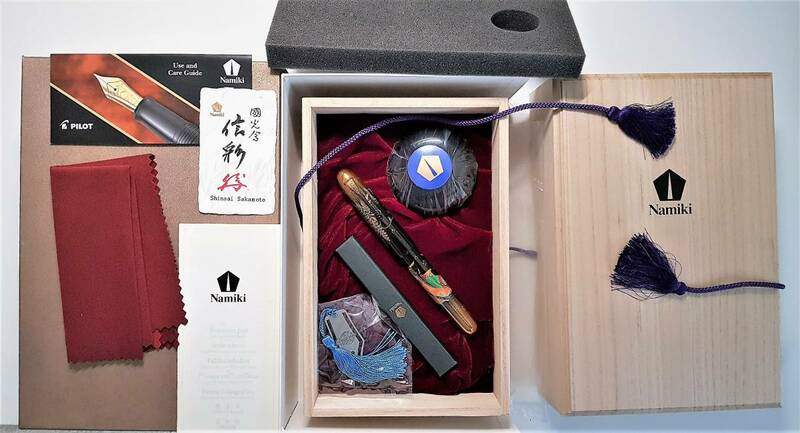 The Emperor Collection is Namiki's highest ranking series. It features a size No.50 (jumbo) pen nib. The body is shaped with ebonite, featuring the "Togidashi-Taka Maki-e (Burnished-Raised Maki-e)" technique, where high skills are necessary. Comes with original box and ink. Ship from Atlanta, GA with PayPal payment.